Today started off with a glitch in my morning routine. As usual, I walked into the kitchen ready to smell the aroma of black silk Folgers dark roast coffee brewing. Instead of seeing the black gold dripping into the pot and hearing the sound of the bubbling perk, I saw only an empty coffee stained pot. I started to go into panic mode and rush out to Walmart for a new one. Then I realized no outlets were working on one side of the kitchen. I knew at that moment it was only a tripped breaker, so I plugged the coffee pot in another corner of the kitchen and, wah lah, we had coffee. That later led to a trip to the hardware store for a new receptacle as well. 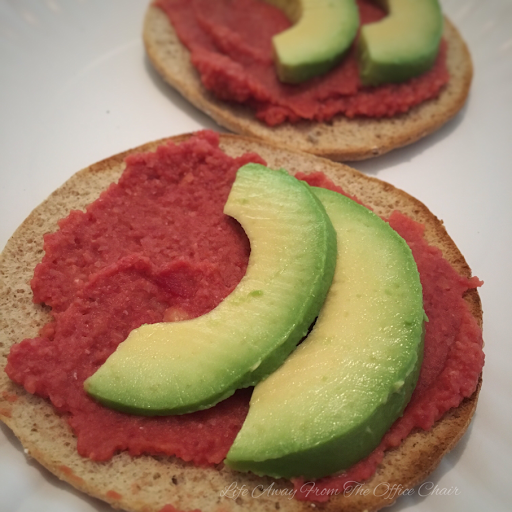 Before we headed out to do some running around, I decided to make this delicous beet hummus to enjoy for lunch. Nick will usually add beets to his salad as they are full of nutrients and health benefits our bodies need. This is what gave me the idea to make this little flavo. This was a new taste to me. I have only tasted a beet once when I was younger. It was pickled and I hated it! Never ate one again. Until today. But these were not pickled, they were roasted. Well, ok they were actually from a can, but they were NOT pickled. This dip/spread is perfect for dipping veggies or chips. We chose to use it as a spread on toasted whole wheat rounds topped with a slimcado. See what I did there? Not an avacado, but a slimcado. You may have seen these in the grocery store before and not even realize what they were. They are grown in Florida and have 35% less fat than an avacado. They are bigger with a bigger seed as well. 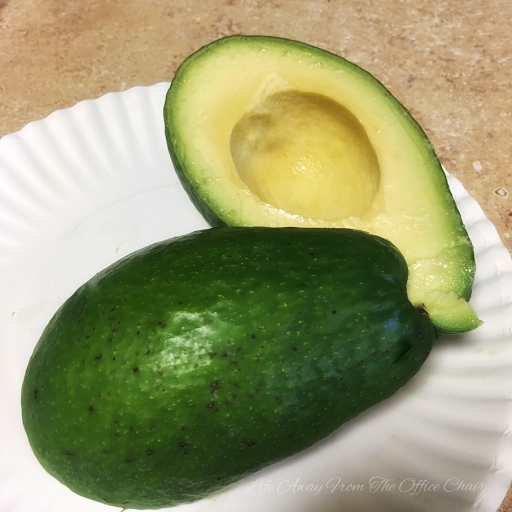 One great thing about a slimcado is that they do not turn black on the outside and the inside does not darken when cut like the avacado. I wrote about them once. You can find that post HERE. This is definitely something I will make again. It was so savory and tasted like Summer. Did I mention this spread is full of healthy ingredience? Can't go wrong here. Use for dip or spread. Perfect on veggies, sandwiches, pita chips, toast or crackers. I still haven't tried a beet alone. You are a wonder, you can come up with stuff 'I ain't never heard of!' Okay I have lived under a rock as far a kitchens go. But I bet your mama never fixed that. It really does look delicious. I eat beets, but they have never had much taste, little taste really, maybe a little earthy. I bet it is really good. Nope Moma never made this! Haha the only dip she made was gravy! i am not a beet person. but like the idea of a slimcado. Its good. Not as rich in flavor as the avocodo but still good. I love roasted beets. I'll have to try your recipe. I've never heard of a slimcado. I have seen the giant, bright green ones in the stores. Is that it? I actually bought one yesterday. Will give it a try. 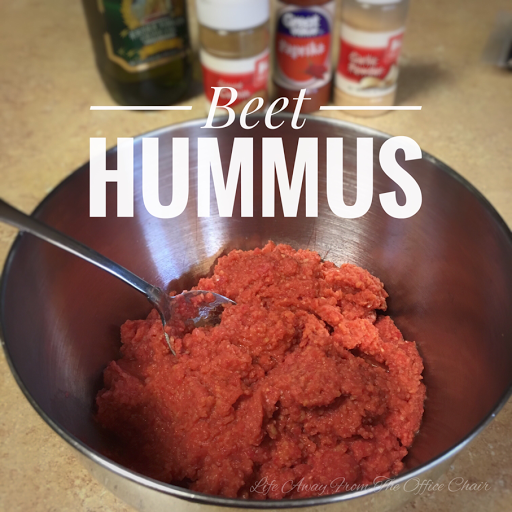 I love beets and humus so it sounds like a win/win. Will pass on the slimcado though. I don't care for the fat version. I'm not really a beet person, so I'm always interested in a new way of preparing them. Try it. It was a first for me! Yes . DO . Let me know how you like it. Thanks for stopping by . Ill be checking out your chicken scaloppini! Hi Lisa, wow this sounds really good. i love beets. Thanks for sharing the recipe at C&C with J&J. Enjoy the week. I love avocados, but I'm still trying to develop a taste for hummus. :) I think it's the texture I don't love. Which is weird, because I love most everything! Thanks for sharing with SYC.